Last year, Paul Garcia from Scottsbluff and Chris Williams from Valentine were crowned state champions as freshmen and began their quest for four state titles while Derek Robb and Cameron Riggs were crowned four-time champions. 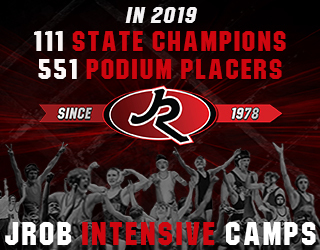 While there are many amazing freshmen competing at the state tournament this year, we will spotlight the ranked wrestlers and a few other darkhorse candidates in each class who are in great shape to grab a state medal. There are two top-ranked freshmen heading into the state tournament – Garrett Grice of Omaha Central and Caden Arps from Archbishop Bergan. Grice is unbeaten on the year, as is Samuel Foster from Sutherland. Who will start their run at history this season? In Class A, there are six freshmen in the rankings who qualified for the state tournament. The highest ranked freshman is #1 Garrett Grice of Bellevue East, who is also unbeaten on the season. His road to the finals will go through #6 Donald who he owns a 11-4 win over. If he wins that quarterfinal he may have Cushing from GI who he hasn’t seen yet this season. Millard South has both Antrell Taylor and Tyler Antoniak ranked second in their respective weights. Both are on opposite sides of the top ranked wrestlers so both could realistically make the finals in weight classes that typically see only upperclassmen on the podium. At 106, Archer Heelan and Brandon Baustert have wrestled multiple times this year with Heelan taking the first several matches, and Baustert winning in the district finals. Will they meet again in Omaha with a state title on the line? South Sioux City freshman #6 Peyton Martinez rounds out our ranked freshman in class A. He will have a possible quarterfinal matchup against #5 Allerheiligen with a spot in the semifinals and a state medal on the line. Like his brother Deon, Justin Davis of Omaha Central has a dynamic style and quite the resume in Freestyle and Greco. A first round win will put him in the quarters against Fry, who is looking for his 3rd state title. His 1-point district loss to #2 Irizarry indicates he’ll be right in the mix for a medal. Garrett Grice is the only freshman in all classes that is both unbeaten and ranked #1. Class B has six ranked freshmen competing in the state tournament this year. There is a trio at 106 with Ourada from Omaha Skutt, Rainforth of O’Neill and Munier of Sidney. Ourada was the lone district champion of the three, and looks to have a great chance of making the semifinals. If Munier wins in the first round, he’ll have #2 Arends in the quarterfinals. Munier pinned Arends in an earlier season meeting. If he wins that one, he could see Ourada with a spot in the finals hanging in the balance. Rainforth could see top ranked Chavez in the quarterfinals. At 113 #6 Michael Mass won a district title with a win over #4 York of Beatrice. He will have #3 Ruffin from North Platte in one of the marquee first round matchups in class B. Also at 113, watch out for Blair’s Landon Templar. He’ll have a tough first round matchup against #2 Russman but even if he drops that one, he could make a good run through the back of the bracket to grab a medal. Darkhorse Trevor Reinke of Beatrice has emerged as a medal contender at 126B. He lost in OT in the district semifinals to #3 Lazure. If he wins in round one he could see #1 Diaz in the quarterfinals. He has two losses to Diaz this season, but they have been by 1 and 2 points, so he will have upset on his mind. Ogallala’s Cameron Zink finished 3rd in a district with four ranked wrestlers in it. There are no other ranked wrestlers in his quarter of the bracket, so he has a very good chance at making the semifinals. 285lb freshman Trevor Brown’s only two losses this year are to #1 Sutton from Wahoo. He owns wins over several highly ranked wrestlers including C#1 Moses. He will have a big quarterfinal matchup against #6 Nielsen, who he beat in overtime earlier this season. Trevor Brown is having one of the best freshman seasons at 285 that we’ve seen in recent years. 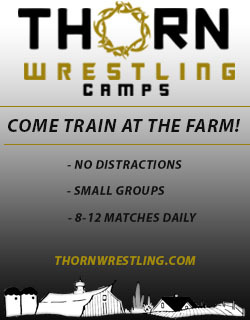 Again in Class C we see a trio of ranked wrestlers in the lightest weight, and they happen to be the only ranked freshman wrestlers in the class. Wood River’s Dylan Ancheta has been in and out of the rankings this year, and with a huge district final win over fellow freshman #3 Reyes, has set himself up for a state finals run. Johnson County’s Reyes beat Bolling from Pierce in the second week of the season. There’s a possibility it will be Bolling and Ancheta in the semifinals on the top side. Reyes will have a tougher road with #2 Benavides in the quarterfinals and #1 Schluckebier in the semifinals. At 113 Eli Vondra from Milford has made significant strides his freshman season. He recently avenged two early season losses to medal contender Schmitt from Wilber-Clatonia, and took #4 Bridgmon to OT at the district tournament. He will have #5 Thompson right out of the gate in Omaha. While most of our spotlighted freshmen are ranked, Cameron Graham from Cross County has all of the makings of a state medalist and probably shouldn’t have been dropped from the rankings based on just a few matches. He has been as high as #2 this season. He won over #4 Lade in the district finals, and if he wins first round will have #3 Feldner, who he has beaten head to head by major decision. Another unranked freshman that has been in the rankings in class C is Gunnar Battershaw from Valentine. He has split with #6 Ulmer of Broken Bow and has been ranked during the season. He will have a tough match out of the gate against #4 Verzani from Wakefield in the first round. Regardless of that outcome, he still has a good chance of capturing a medal. Cameron Graham of Cross County made waves when he knocked off returning state champ Brandenberg at his home invite. Class D has the most freshmen ranked with a whopping nine wrestlers in the top six. At 106 is the unbeaten Samuel Foster from Sutherland. His recent win over C#2 Benavides indicates he should be in the mix for a title. He will have a huge quarterfinal matchup on Thursday against #2 Lanham. 113 has three freshman ranked in the top four! Top ranked Caden Arps from Bergan leads the pack, as he has wins over both Ashburn from Plainview and McLaughlin of Thayer Central. Arps and Ashburn could collide Friday night in the semifinals. McLaughlin is on the opposite side of the bracket, and may have #2 Marshall of Mullen in the quarters. Cyrus Wells from Anselmo-Merna has only four losses on the year, three of which came to #3 Shields. The other to #6 Wood, who has beaten twice. D120 is unbelievably tough this year and Wells will be tested out of the gate against returning state medalist Smith from Elm Creek. If he wins that one, he’ll have Larson from Brady who he has two very close wins over. In the semis he could have either #2 Ellis or #6 Wood. There are two ranked freshman at 126 in class D. Quentyn Frank from Amherst and Cal Janke from Bergan. Frank finished runner-up to #1 Christensen at districts, so he will be on the opposite side with an eye on the state finals. Janke could see Christensen in the quarterfinals. Darkhorse Gabe Escalante has a win over his first round opponent Gideon. He would have #3 Reimers in the quarterfinals and may end up wrestling Janke in the heartbreak round to get a medal. At 138, North Central freshman Levi Lewis has earned himself the #5 ranking. He’ll square off against either #4 Laible or #6 Stewart in the quarterfinals. He’s 1-4 against Laible this year but all matches have been competitive. Keep an eye on Art Escalante at this weight as well. He does not have a ranked wrestler in his quarter of the bracket and could potentially make the semifinals. Our final ranked freshman in class D, is Plainview’s Will Gunning. He has a possible quarter against unranked Pozehl from Ainsworth, who knocked off #3 Vondra in the district finals. Caden Arps is one of two top ranked freshman in the state this year. February 11, 2019 in 2019 State Tournament, High School, State Tournament, Uncategorized.